So last week I clean-swept my closet. Of course, I share it with hubby and cleaning the closet wasn't on his radar, so it wasn't a total sweep. In the spirit of simplifying, I piled a huge wad of my clothing on the bed and began to sort. And sort and purge I did. Four trash bags full for Goodwill. 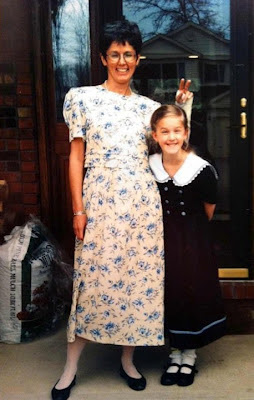 You might remember this post in which I wondered why I was keeping dresses from the 90's. Well, I came across another dress, this one from 2005. This dress was the find of the decade! I found it while hunting the sale racks at Macy's. I remember being extra-thrilled with the price, something like $11.00, down from $85.00. It's silk and lined and so comfortable. I wore it to David's college graduation in 2005. Even with a too-long hemline, I liked the dress, but it got pushed back in the closet for several years. Today I pulled it out, tried it on and was tickled to find that it still fits! The tag claims that it's a size 4, but since I haven't worn a 4 since I was 13 years old, it must be mismarked. So now my plan is to shorten it by about 8 inches and wear it to Katie's graduation in three weeks. A lot of the things that I found in my closet are going to Goodwill. But my silk dress is a keeper. I found your comments on my last post interesting. Not all teen boys hold back their affection for mom, and you moms are blessed! But in my opinion, teen boys who hug their moms in public are the exception rather than the rule. My favorite comment was from the "boy" I described in the post, my son Dan, the one who pushed me away when he was 16. He's 27 now, a husband and father. He commented, "I'll hug you anytime, Mom. Love you!" Most kids do come around in their 20's. 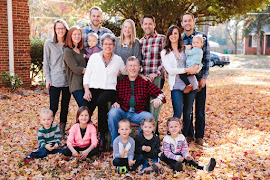 Suddenly mom and dad know a few things, and we become more a friend than parent. Of course, getting to that new point in the relationship means we have to let go. Intentionally, over and over. I've found that letting go isn't just leaving them at college when they're 18. Nor even when they marry. Just like learning to parent when my children were small, I must unlearn that role bit by bit. Opinions and advice held back. Giving them space to try, to stretch, to grow, and sometimes to fail. "Just cut those apron strings!" I tell myself. But they aren't always neatly snipped. At times they are pulled and torn by a maturing boy (or girl). I'm learning that the frayed edges will be fewer when mom is willing to gracefully let go. 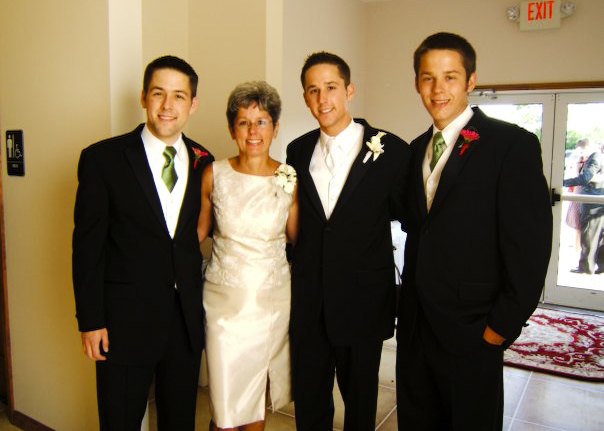 With my boys on Dan's wedding day in 2007. He came by this morning to walk our yard and talk over some landscaping ideas. He is tall and lean, fit from physical outdoor work. And handsome. I so wanted to hug him, and very nearly did. But that moment of propriety held me back. That split second that you realize maybe it's best not to say or do whatever urge is there. But I really, really wanted to hug my landscaper. Because he's also my son. I think most moms face this quandary. Sons reach about 12 years old and give mom the message loud and clear: "no PDA!" I get it. Being mothered just isn't very manly, I suppose. Boys need space to watch their dads and learn to become a man. If mom doesn't step back, her son will push her aside. When one of our sons was about 16, I tried hugging him good-bye as we left separately from our vacation. He was going on a mission trip while we headed home. Trouble was, there were several of his peers standing there. I should've known better. He pushed me away, refusing any motherly affection. I cried for the first half hour of our trip, in sadness and anger. I changed that kid's diapers, woke him in time for school, went to all his ball games, made his lunches and helped with homework. I even let him shoot me with a paintball gun. And he couldn't give me a hug? If boys came with an instruction manual, the first page should stress this rule: hug your mother, unashamedly and often. She raises you, then sets you off in life to be strong, to be a husband and father. So when you don't need her so much, maybe she needs a little of you. A little love. And a few hugs. My church, Delaware Christian, worked around town over the weekend. We call it Impact Delaware, partnering with the Council for Older Adults and Common Ground Free Store Ministries. Through the council, our volunteers were assigned to various senior citizens who need help with yard work: raking, mowing, weeding, mulching, window washing. While working, our teams also made an effort to chat with the people, and pray with them if they wanted. Though the chores make a difference for these folks, I believe the contct with friendly and caring people makes a bigger difference. The weather was horrible: cold, drizzly and windy. But every team was working and serving with a smile. I was assigned to photograph our teams at work. Here's one of my favorite photos: a dad and son working together. Our pastor, Al, and his family served lunch to clients at the free store. And lots of other work went on there, too. My friend Sarah. Always cheerful! Hearts driving hands to make an impact ... it was a good weekend. Changes swirl all around me. Changes in work and life. My body feels older. where I write these posts. weeding, and spotting signs of spring. Like this robin's nest on our electric box. though I didn't touch, just raised my phone high enough for a photo. I find solace out in my yard. 'wrestle with things before God,"
And besides, digging in the dirt is very therapeutic. In one month, our last child will be a college graduate. Yet I have a "what's next?" feeling creeping in. No more spring and Christmas breaks. Or gathering of The Piles of college stuff in August. Or finding space for it in May. Or loading up the mini-van. Or wondering if no phone calls is a good thing, or bad. Or getting to meet their college friends. no more sense that we have CHILDREN-children, rather than young adult offspring. 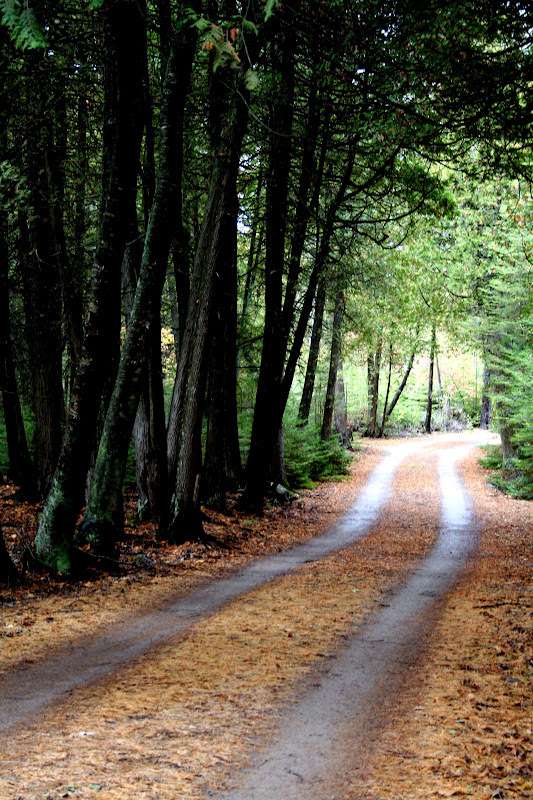 now they have and I have a road of my own making. We've worked ourselves out of our jobs as parents, I suppose. I know, I know. That's the idea! always one or two or three more behind who needed us. But (and see Tuesday's post) this is really and truly the end of one season of life. but I'm not sure how to travel this new road. What I thought would be a quiet week has turned into a busy one. Somehow, every year I forget how much time I spend poking and puttering in the flower beds. Glorious, it is! But then other things take a back seat. Yesterday I started another type of weeding: my clothes closet. I've done this many times, but this time it's serious surgery. Time to throw out dresses from the '90's. When on earth would I ever wear those again? Katie's dress is also tucked in a closet, and a granddaughter might possibly wear it someday ... yummy, navy and white! ﻿Anyway. Back to the gardens. The day was too lovely and wind-whipped and sunny to stay inside, so out I went to putter and weed. Armed with my sharp hoe-ey thing and miniature rake, I stepped into my shade garden out back. It was then I began to notice so much. I invariably crushed an emerging hosta or lily-of-the-valley. They are small and haven't exploded into their summer space. They are camouflaged by last autumn's leaves. destroying the tender new life at my feet. Finally I slowed down, gingerly stepping here and there. the weeds that must come out. New weeds are easily pulled before they take deeper root. I think it is very similar to my time in the shade bed. As a young mother I learned to watch my steps around my children. My example mattered. Very much. their spirits were easily crushed. the weeds of anger, insecurity, loneliness, hostility, and fear are sure to creep in. She must be there early and often to check for weeds. they find freedom in the space called life. I am in a new season now. But it was unspeakably worth my season in the garden. One hundred years ago tonight, the ill-fated Titantic struck an iceberg and sunk into the frigid North Atlantic, taking 1500 people with her. Left behind were 712 terrified men, women and children bobbing in lifeboats. 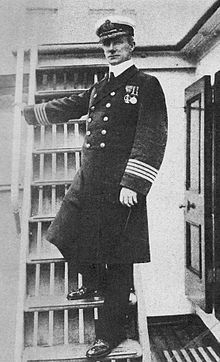 In a race against time and the elements, Captain Arthur Rostron of the RMS Carpathia came to the rescue. Although just 60 miles away and closer than any other ship, the Carpathia would take several hours to reach the freezing Titanic survivors. Navigating icebergs on the moonless sea would be no simple task. The captain had to first consider the safety of his own passengers and crew. Navigation to the site, preparation for rescue and medical needs and countless other details needed immediate planning. Rostron's quick-thinking and correct orders to his crew saved hundreds of lives that night. Once his orders had been dispatched, Rostron was seen, head bowed, in prayer. This editorial brought Captain Rostron to my attention. His memoir entitled Home from the Sea might be worth a read. The Titanic is in the headlines today. But Arthur Rostron deserves a headline, too. I see that a couple of movies are opening this weekend. I'm afraid I'll have to pass. Just the 'R' rating description of The Cabin in the Woods gives me the creeps. "Strong bloody horror violence and gore." Doesn't that just grab ya? Then there's The Three Stooges. Perhaps more tame with a PG rating, but this updated version of what we watched as kids promises "slapstick action violence, rude and suggestive humor." One review said those who would like it most are teen boys and young men. Folks, I raised my own version of the three stooges. I've witnessed enough rude bodily noises to last a lifetime. I've seen all the poked eyes, smacked heads, tackles, trips and bathroom humor I need. I don't care to pay $8 and relive it for two hours. Give me Jimmy Stewart in Rear Window. Or Audrey or Katharine Hepburn. On Golden Pond, Sleepless in Seattle, or the wonderful Waking Ned Devine. Miss Potter is another good one, all about Beatrix Potter. And yes I do give some new flicks a chance. We watched Moneyball the other night and liked it. These movies might have fabulous premieres, and they probably won't miss me. Call me picky, but a movie has to be worth my while for me to watch it..
My precious little granddaughter Lily is two months and two days old. She started out small but is growing vigorously! Her mom Jill says that Lily has waking hours during the day and evening, but I'm beginning to doubt, because Lily is asleep for 93% of the time she's with me. The other day, Jill stopped by to see Katie before she headed back to college. "She was awake during errands. But as soon as we pulled into your drive, she fell asleep!" Lily awakened briefly as Jill carried her into the house, but as soon as she was in my arms, she dozed off. This has held true for much of my time with her. Either I'm a very boring Baba, or you're just comfy with me, Lily. Of course I like to think the latter. Soon you'll be an energetic toddler tearing around my house and my life. For now, I cherish your adorable, sleeping self. I drove home alone with my thoughts last Thursday. Winding through Kentucky and across the Ohio River, I didn't listen to much music as I typically do. Seven hours, just me and my thoughts. I was coming home from visiting my dad. There is still laughter and recognition and love. And his wittiness. But in the two days I spent with my father, I was sucked into the vortex of his increasingly confused mind. How he wants to be engaged in life and work. He plans to buy a horse so my sister (age 51) will have an after-school project. He sees parades of bugs on the ceiling. He wants to buy back the property he farmed 60 years ago. "I know how to run a farm," he said. He wondered aloud why I didn't bring my babies, my boys, with me. I am not even sure he differentiates my deceased mother from my step-mother. eyes locked on me and an opaque-skinned hand cupped in mine. I asked him if he loves Jesus. He nodded. I told him to love others like Jesus. Plain and simple. His eyes, his hands, they aren't my father's. After 87 years, they are aged and delicate. And they serve to stir up gritty emotions in me of the loss that is sure to come. That in a sense has already come. "He's in a good place, the right place," people reassure me. Then I remember, such is life on earth. The tighter my grip on this life, the less I will look forward to the next one. I am here for you now, Dad. But we'll always be together. You have made my days a mere handbreadth; the span of my years is as nothing before you. Taking a short hiatus. For now, I'll leave you with this. It's something I must constantly chase after. Where there is a thankful spirit, there is joy. Be thankful. Be joyful. See you soon.